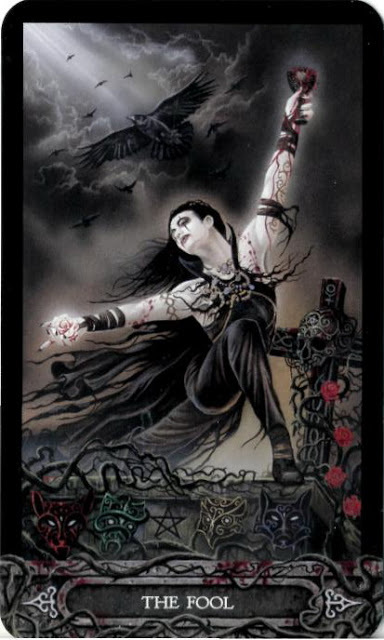 The Tarot of Vampyres is a gothic vampire themed deck in the traditional Rider-Waite format with a few minor exceptions such as the names of the suits (Scepters, Chalices, Knives, and Skulls) and court cards (Daughters, Princes, Queens, and Lords). The finely detailed images by British artist Ian Daniels are top notch but what really makes this an excellent tool for divination is the companion book that is a whopping 312 pages in length entitled Phantasmagoria. In it Daniels explains the Jungian concept of shadow. He feels that acknowledging our fears, and facing them, helps us to understand and overcome them. Often these fears reside in the shadow, or dark side of human psychological nature. The Fool is shown emerging from a tomb, with arms thrown wide open. He holds a white rose in his right hand, the Holy Grail in his left hand.